The state’s top Buddhist authority has said it will rein in the activities of hard-line nationalist monks participating in the Committee for the Protection of Nationality and Religion – also known as Ma Ba Tha. “Some of Ma Ba Tha’s ideas are aligned partially with those of Mahana [the Sangha] because they are under our guidance. But some Ma Ba Tha members are intense on religion and race and go against the committee’s stance,” said State Sangha Maha Nayaka Committee general secretary U Sandi Marbhivamsa. The general secretary said Ma Ba Tha should obey guidelines set by the committee. “Some Ma Ba Tha members are fiercely against Muslims and don’t follow the former leader’s guidance. Actually they do not represent the whole committee,” U Sandi said. No action has yet been taken against any Ma Ba Tha members because of weak implementation of the regulations, according to the monk, who said authorities can take action against monks breaking the law. The Sangha’s announcement was made on the same day that Ma Ba Tha leaders sent letters of support to nationalist protesters in Mawlamyine in Mon State, who staged a demonstration yesterday against the use of the term “Rohingya” to refer to a Muslim group living mainly in Rakhine State. 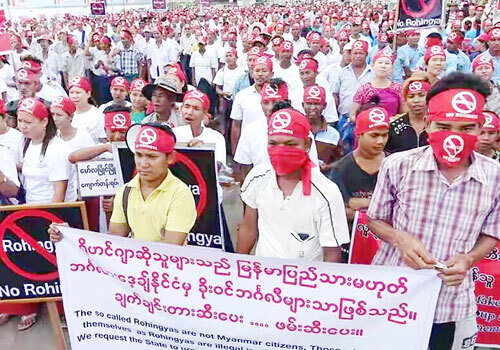 People gathered on Strand Road in Mawlamyine where they demonstrated by holding posters saying “Against Rohingya”. “We are protesting to show the new government that we are against the use of the term ‘Rohingya’ instead of ‘Bengali’,” said protest leader Ko Than Zaw. He said the protest had been organised by nationalists who were not from a particular group or party, and estimated nearly 1000 people participated in the demonstration. “The members of the new government must know that they cannot accept the Rohingya. If they do, they will be breaching the citizenship act,” Ko Than Zaw said. Since the US embassy used the disputed term in a statement to express condolences to the victims of a boat-sinking incident on April 19 off the coast of Sittwe, protests have been taking place around the country. Protests have since been held in Yangon, Mandalay, Pathein and Taunggyi. Yesterday’s was the sixth such demonstration. Letters of support were sent to the protesters by Ma Ba Tha chair U Tilawka and nationalist monk U Wirathu, as well as by the Patriotic Myanmar Monk Union and the Myanmar Nationalist Network from Yangon.